Magnificent two panel wall map. One of the finest maps of Asia to appear in the early 19th century. 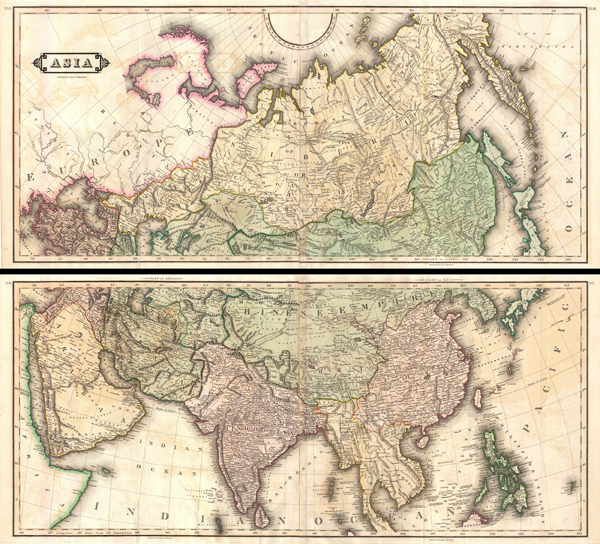 An extremely appealing large format c. 1820 map of Asia rendered in two panels. Truly one of the most beautiful large format maps of Asia to appear in an early 19th century atlas. Drawn by Daniel Lizars this map covers from the Mediterranean to the Sea of Kamchatka (top panel) and from the Red Sea to Japan (bottom panel). The map further extends north as far as the Arctic and south as far as Ceylon and Borneo. Stylistically this map follows the conventions established by Thomson, Pinkerton, and Cary at the turn of the 18th century, especially with regard to coloration, border design, typography, and topographic schemes. Cartographically, while ostensibly similar to earlier 19th century mappings of Asia, Lizars does incorporate a number of advances most of which are derived from Russian surveys in Siberia and Central Asia, as well as nautical expeditions to the Russian Arctic, most specifically around New Siberia and the Liakhov islands. In India, evidence of British cartographic work of the late 18th century, particularly that of Rennell, is apparent. Persia, Arabia, and the Near East clearly benefit from Ottoman mapping efforts. The remainder of the map reveals just how extremely scarce information about Asia was even in the early 19th century. Along the coasts of Japan and Korea Lizars references Janson's 17th century maps. Lizars' Central Asia is based on even earlier cartographic information dating to Marco Polo and the Mongol Empire. Even the old capital of the Khans, Karakorum, is noted. China is correctly divided into China Proper, and the greater Chinese sphere of influence, here called the Chinese Empire, stretching from the Kashgar to Korea, inclusive of Tibet. Southeast Asia is weakly mapped though does represent the regions before significant colonization efforts by the British in Burma and the French in Vietnam and Cambodia. Furthermore, this map was clearly drawn during a period of Burmese ascendance with the Birman Empire embracing all of modern day Burma and Thailand. Drawn and published by Daniel Lizars, possibly for his c. 1820 Edinburgh Geographical and Historical Atlas. The brothers William (1788-1859) and Daniel Lizars (1754-1812) were Edinburgh map publishers active from roughly 1800 to 1845. Their work follows closely in the style pioneered by Cary, Pinkerton and Thomson, with whom they often worked. William and Daniel's official partnership terminated in 1818, however, each continued to publish separately well into the mid-19th century. Daniel's apprentices included such notable cartographers as George Bartholomew and his own son, Daniel Lizars (1793 - ?) the younger. Daniel, the younger, continued in his father's tradition and most notably invented a method of copperplate engraving that could imitate a woodcut. In 1833, following the Daniel's personal bankruptcy, he emigrated to Canada, where he died many years later. William Lizars continued to publish until his death in 1859 when the firm was acquired by W. & A.K. Johnston, giving birth to another great cartographic tradition. Lizars, D., The Edinburgh geographical and historical atlas, comprehending a sketch of the history of geography ... and history of each continent, state, and kingdom, delineated. And a tabular view of the principal mountain chains in the World. Engraved on sixty-nine copperplates, and compiled from materials drawn from the newest and most authentic sources, (Edinburgh), c. 1820. Very good. Minor wear and verso reinforcement on original fold lines. Old centerfold exhibits minor glue transference. Size represents both panels if framed together. Rumsey 0436.043, 0436.041, 0436.042 (1831 edition).